I've posted before about how little - relative to surfing's popularity - there is in terms of literature about surfing. I'm still not sure of the reasons for this but perhaps the tide is turning. Fresh evidence comes in the form of a book called Surfing's Greatest Misadventures, publised by Casagrande Press and edited by Paul Diamond. 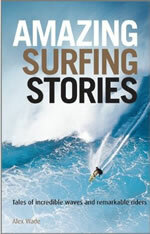 I'll post a more detailed review soon, but as it is I've thoroughly enjoyed five of the collection of some 30 surfing tales by surfing journalists, filmmakers, cameramen and watermen. The editing is flawless and the writing - so far - first class. Susan Chaplin's wonderful account of surfing in Mauritius - The Idiot Savant - is my favourite to date. Chaplin' s style is simple, paired back, fluid; it encapsulates beautifully the journey that brings her to Mauritius and, indeed, her life. As a Mauritian called Tiano puts it: C'est un voyage pour cherchez les vagues.